Coir is the fibre from the coconut husk and is the most rustic of the natural floorings, however this only enhances its natural beauty and is great when used in areas where softer floorings won't do. It is very strong, extremely good value and has been used as a flooring for centuries. 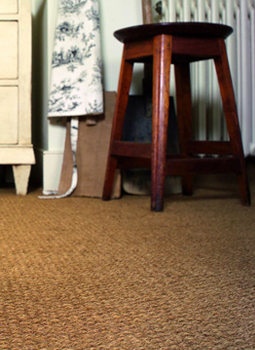 Jute is a wonderful natural flooring option. One that is finer, and therefore more suitable to intimate living spaces than to high-traffic areas (for which you want tougher fibres such as coir, seagrass or sisal). Jute fibres are extracted from the inner bark of the stalks of a plant called Genus Cochorous, grown in Asia. Hand harvested, soaked in water and then dried in the sun, these silky fibres have a soft lustre and very sensual feel.